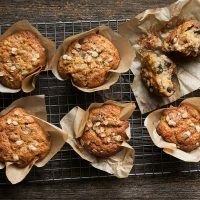 Delicious, light banana muffins, studded with chocolate chunks. While best on the day they are baked, they keep well for several days. These would freeze well, as well. In a medium bowl, whisk together the flour, baking soda, baking powder and salt. Set asdie. In a large bowl with an electric mixer or the bowl of a stand mixer with a paddle attachment, beat the butter on medium speed until light and fluffy, about 2 minutes. Add the brown sugar and beat until fluffy, about 2 minutes more. Add the egg and vanilla. Mix just until combined. Add the flour mixture to the batter in 3 parts, mixing just until combined after each addition. Add in the mashed banana and sour cream, mixing on low for about 30 seconds. Using a spatula, fold in the chocolate chunks until combined. *If you have the time, cover the batter and refrigerate it for a few hours, for absolute best results. If not, go ahead and bake right away. Line 6 muffin cups with parchment liners. Divide batter between the muffin liners. Top with a bit of rolled oats if you like. Place in oven AND IMMEDIATELY REDUCE OVEN TO 325F. Bake for about 25 minutes, or until muffins are golden brown and a tester comes out clean. Allow to cool in the pans for 5 minutes, then remove from pan, in wrappers, to a cooling rack to cool completely.